How was everyone's first official weekend of Spring? I enjoyed the sunny warm weather with family all weekend. It was wonderful. Sadly, my main camera lens broke, and until I get the replacement I have ordered, I have only stuff from last week's rain showers to share. I do not mind though. I love the spring rains, especially when they break just long enough for me to venture outside. Luckily, I do not have to wander far to find a photo opportunity when the weather is wet. 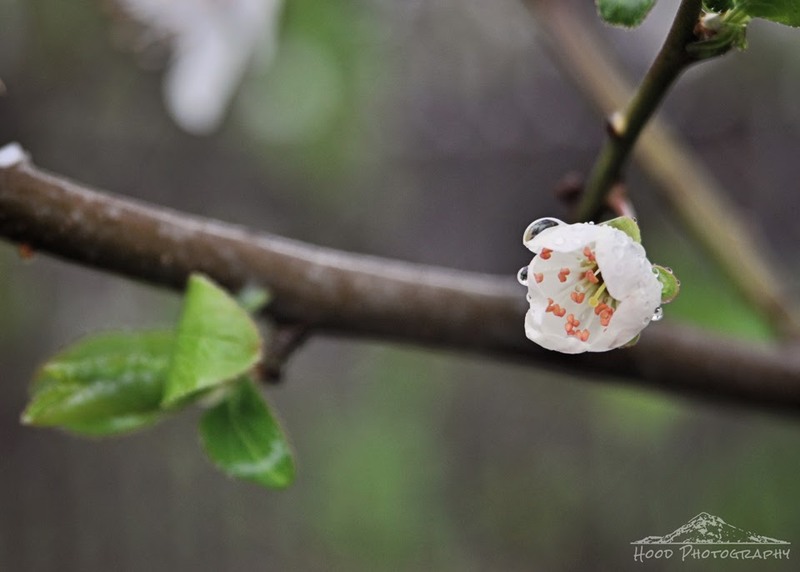 This plum blossom was just opening on the tree in my back yard. It's just perfect. I love the center (stamen?) of the flower - the peachy/pink color! Nice job! Beautiful shot! Sweet delicate flower! Well done! Love the dripping blossom! Yep, spring has busted out around here hasn't it? Ohhhh - so beautiful - and looks like spring is coming! oh splendid!! We are having temps in the 20s and expecting a snow storm tomorrow night. We had a snowstorm again on Saturday. Nothing more enjoyable than a stroll in one's garden following a shower.